AMG has this album rated at 1.5 stars. Really. Check it out here. Yes it's not the best album that Gryphon put out, but it's not bad. It's a delightful little prog rock album, steeped in the keyboard flourishes and a krauty, droning sound. 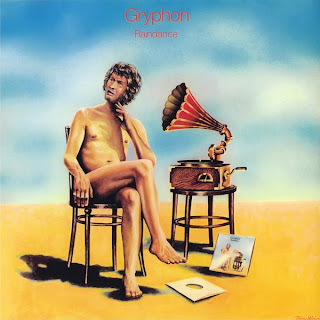 It catches a lot of flack because it is definitely different than Gryphon's albums before this, which were sort of like really nerdy medieval folk prog pieces, which are a lot of fun in their own right. However, the variety on Raindance is why I like it. Track 2, "Raindance" is basically just a 5-minute interpretation of falling rain, simulated by a keyboard, and that is followed by the great Lennon/McCartney song "Mother Nature's Son"...here done in a bit of a more 70s, folk rock manner. Immediately following that is "Le Cambrioleur Est Dans Le Mouchoir" which sounds like the soundtrack to some funny movie from the 30s. And the next song sounds like it should open up a PBS special or something. Listen, it's not the best album, but it's an enjoyable listen with lots of variety in the sound. At the very least, you should download this album for the closing track "(Ein Klein) Heldenleben" which is 15+ minutes of Prog gloriousness. It's not a challenging listen, but it's fun for sure.